I love my clothes and I absolutely love it when they're hilarious, which is exactly what you'll get from Crazy Dog T-Shirts. They have such a wide selection of funny T-shirts that it makes choosing one so hard! I know, its Father's Day coming up, but c'mon, can't I have one thing for myself? (Nod your head! 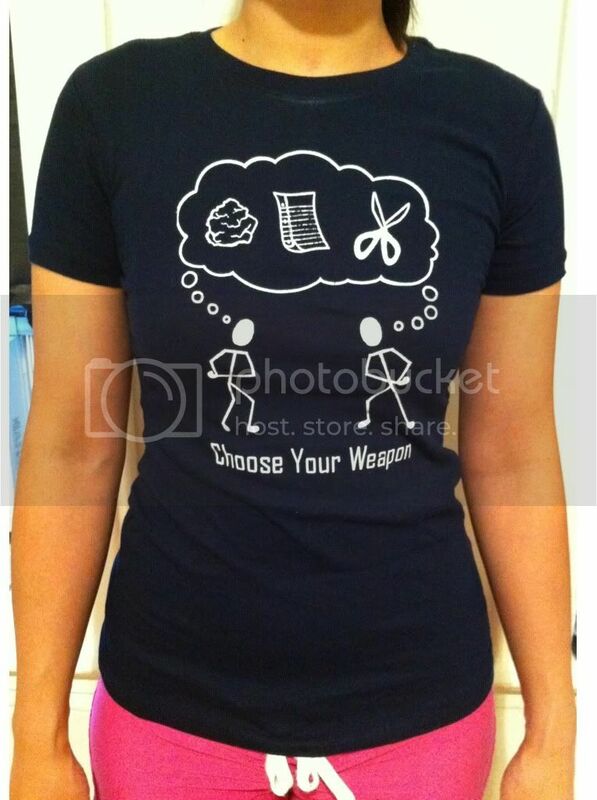 lol) So, I ended up choosing "Choose your weapon" under Girl's T-shirts. By the name, you're probably thinking what!? But, take a look, its hilarious! Who would think of it being a rock, paper, scissors battle? Point is, I think its cute and I love the design! The fit was great on this t-shirt and it was so comfy to wear that I could sleep in it! Its definitely one of those shirts that I would wear every day of the week if I could. The material is fairly light but so incredibly soft that I felt like rubbing my face in it. Its not microfiber soft but its getting there. I would recommend Crazy Dog T-shirts to everyone, fairly priced and they would make great presents not only for Father's Day but for other occasions. Mmhmm, definitely happy I snagged a shirt for myself. Sometimes, you just have to indulge yourself to find a perfect shirt. Buy It: To purchase any of the items from Crazy Dog T-Shirts, shop online now ($6.99+). Win It: One lucky Whirlwind of Surprises reader is going to win a $15 GC to Crazy Dog T-Shirts as part of the Father's Day Blog Hop Giveaway Event with over $250 worth in prizes! Make it easier on yourself later by visiting and liking Crazy Dog T-Shirts on Facebook and following @crazydogtshirts now. Disclaimer: The product/s mentioned above have been provided free of charge from Crazy Dog T-Shirts for the purposes of this review. Opinions expressed belong to Whirlwind of Surprises and are NOT influenced in any way. Please view my full disclosure. Great site! Really helpful information! Just found your blog on the blog hop and am following, hope you'll follow back! Great shirt :) Just stopping by from Monday Mingle and now a new follwer. Hope you can stop by my blog.